I bet he wants a mop. Or a sponge. Cuz that’s disgusting. 5 Responses to I bet he wants a mop. Or a sponge. Cuz that’s disgusting. Intruder says, “Well, actually, I was wondering if I could borrow a few minutes of your time to offer these magazi-” SLAM! Ah yes, the early days of picasso, they were odd. 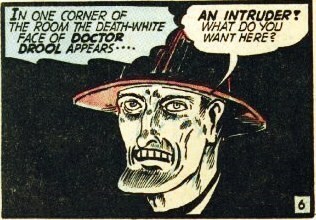 He had to settle for being called Doctor Drool because Doctor Incontinence was taken. Looks more like Doctor Constipation.